● Your electrical contractor will perform all labor to provide you with full electrical function. That includes installation of light fixtures and appliances. ● Provide all material except light fixtures, smoke alarms, and appliances. ● Provide and install all wire and cable for phones and TV, unless you’re hiring a separate media contractor to install a structured wiring system. ● Request all electrical inspections. 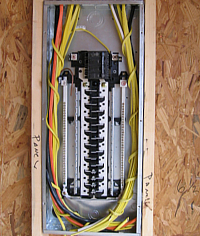 The bundled wires in photo are for a security system. If you will have one, it requires a terminal which requires power. 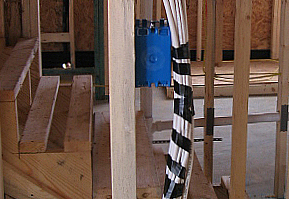 Your electrician will need to know a terminal location in advance of starting his rough-in. If your area requires underground electrical service (photo right) establish upfront if your electrician will take care of trenching and conduit. 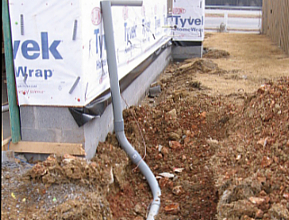 You may have to hire your own trenching contractor to dig and install conduit. Remember that the conduit will require inspection before it is covered.